The historic Log Inn Restaurant was built in 1825 as a trading post and stage coach stop. The first stage coach started running on what was once an Indian trail between Evansville and Vincennes in 1824. The fare was $3.50, four to six horses were used and changed every 12 miles. It is reported that, in 1844, Abraham Lincoln stopped here during a campaign tour speaking for presidential candidate, Henry Clay. The fourth owner of the Log Inn was Henry Haub who later founded the nearby town of Haubstadt in 1855. Throughout its long history, the physical structure of The Log Inn has undergone many transformations. Though none of the original log structure remains visible today from the outside, visitors can still see and dine in one of the original log rooms. It is reported that, under the log part of the building, there is a full cellar which was reputed to have been used as a hiding place for runaway slaves during the Civil War period. Today, The Log Inn is recognized as the oldest restaurant in the state of Indiana. It is widely known for its family style dinners and has been named as one of Indiana’s Favorite Hometown Restaurants by the Indiana Association of Cities and Towns. 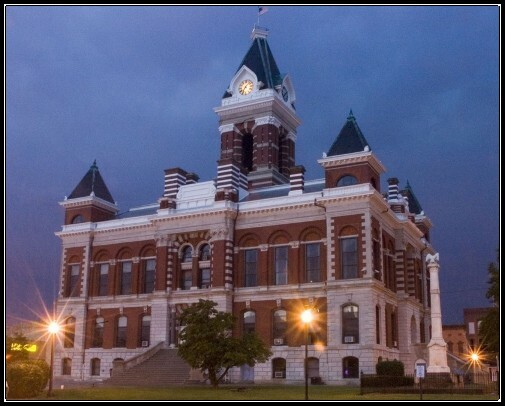 Often described as the jewel in the county’s crown, the Gibson County courthouse sits right in the center of its county seat of Princeton. The present structure is the third courthouse built in Princeton. Its cornerstone, which can be seen on the northeast corner of the building, was laid in 1884 and construction was completed in 1886 at a cost of $188,661.00. With its four corner towers framing four original center entries that form a Greek cross, it stands as a picturesque example of the Romanesque Revival style of architecture. The north and south entries to the courthouse feature high relief male mascarons while the east and west entries feature high relief female mascarons. The exterior of the courthouse was built using limestone from Bedford, Indiana and brick manufactured in St. Louis. Interior construction materials included black walnut grown in the county as well as mosaic tiles and oak flooring. The courthouse was placed on the National Register of Historic Places in 1984 and was also used as a model for a piece in the Original Department 56 Snow Village Collection. The courthouse is open Monday through Friday from 8 am until 4 pm. Guided tours can be scheduled by contacting the Gibson County Visitors & Tourism Bureau at 888-390-5825.101 North Main St.
John Severns, Sr., a native of Wales, is recognized as the first white settler in Gibson County. While enlisted as a soldier during the Revolutionary War, he secured a furlough to visit his parents in the wilds of West Virginia. While there, he was captured along with his entire family by Indians. His father, mother, a younger brother and sister were murdered by them while he and his older brother were held as prisoners and taken back to an Indian town somewhere on the headwaters of the White River. After being a prisoner for seven years he made his escape and soon afterward married and settled in Kentucky where he lived for three years. His older brother, who was captured with him was given to another family of Indians and taken away and he never saw him again. This brother was adopted by a prominent chief and later married an Indian woman. In 1789 John Severns, Sr., settled with his wife and five children on the south bank of the Patoka River, two and one-half miles north of Princeton, Indiana at a point now known as Severns Bridge, where he ran a ferry boat. This point was long known as Severns Ferry, later Severns Bridge. Because of his knowledge of the Indian dialect, their manners and customs, he was able to make friends with the Indians and they permitted him to settle among them. 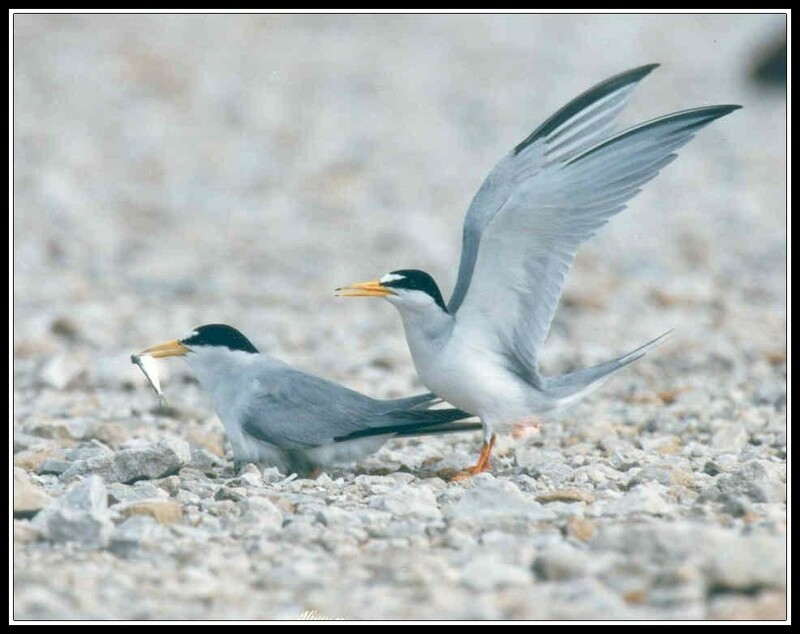 At that time there was a large Indian town on the north bank of the Patoka river, nearly opposite his home. John Severns, Sr., died in about 1829. 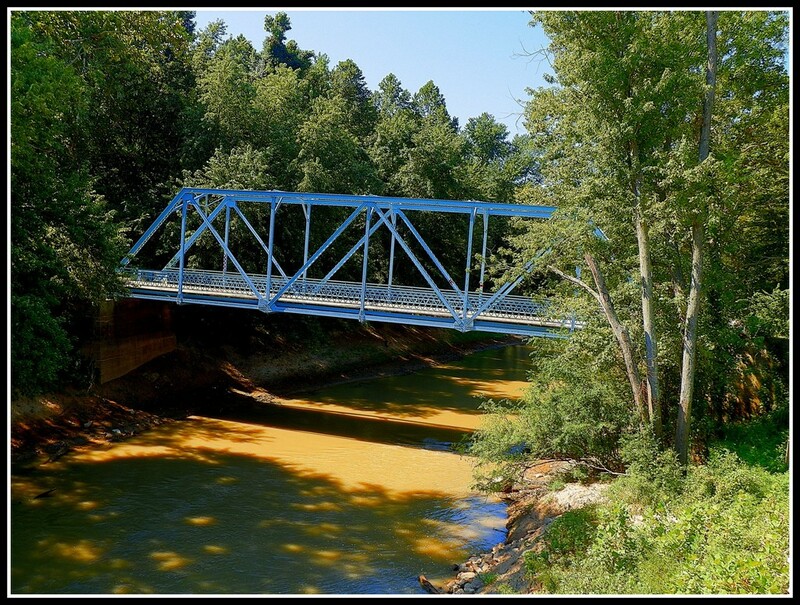 Severns Bridge was constructed in 1908 and rehabilitated in 2009 by the local government and Federal Highway funds. The benches, picnic areas and walking path were donated by Toyota Motor Manufacturing Indiana and built by Toyota team members. Driving Directions: From downtown Princeton, follow State Road 65 North approximately 3 miles to bridge on left. 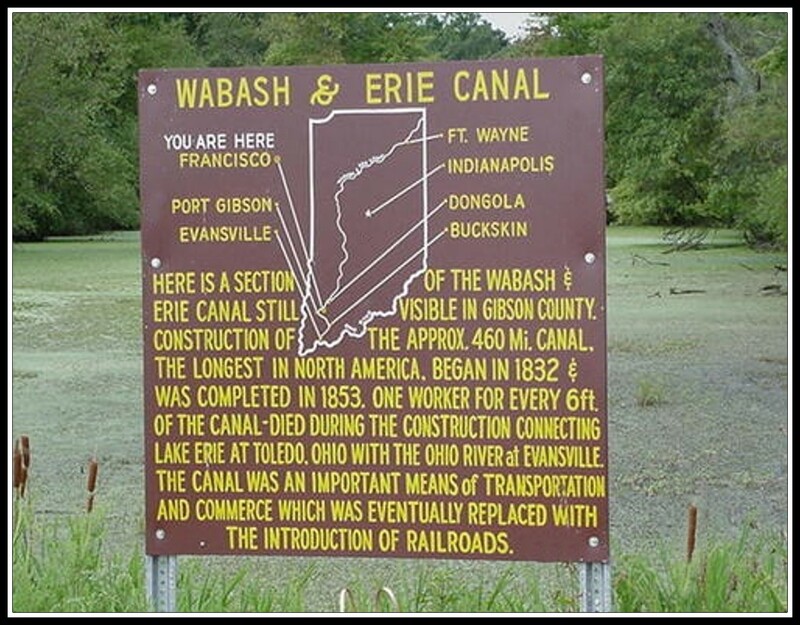 The Wabash and Erie Canal was a shipping canal that linked the Great Lakes to the Ohio River via a man-made waterway providing traders with access from the Great Lakes all the way to the Gulf of Mexico. Completed in the mid-1800’s most historians agree the period between 1847 and 1852 was the heyday of the canal. In Indiana, the 40-foot wide canal was built mostly by Irish immigrants using shovels, picks, wheelbarrows, and the horse-drawn slip-scoop. By 1837, there were 1,000 laborers employed on the state’s canal system. Accidents, fever, cholera, fights, and snakebite exacted a heavy toll on the workforce. It has been reported that the toll in lives from the building of the Canal was one person for every six feet of completed Canal in the forty-mile stretch between the Indiana / Ohio state line and Junction, Ohio. This figure, however, has been vigorously contested by some canal historians. Several types of boats traveled on the canal but the two used for business were the packet and the line boat. The packet was primarily used for transportation of passengers while the line boats hauled freight. From 1853 until its demise, canal receipts steadily declined. The canal could only remain navigable for eight months a year. One of the great ironies of history is that the slow-paced, mule-driven canal boats transported the rails from foundries for building the railroads which ultimately put the canal out of business by the 1870’s. Though most of the canal has long since deteriorated, parts of the towpath and some small segments of the canal itself are still visible along the south side of the gravel road which runs along side of the canal. Directions: West of Francisco at the intersection of County Roads 175 South and 550 East. From I-64 take US Hwy 41 North to IN SR 64 East through Princeton to County Road 550 East, then south to the intersection of County Road 175 South. Catch all of the excitement where NASCAR superstar Jeff Gordon raced as a fourteen-year-old on this 1/4 -mile high banked dirt track. 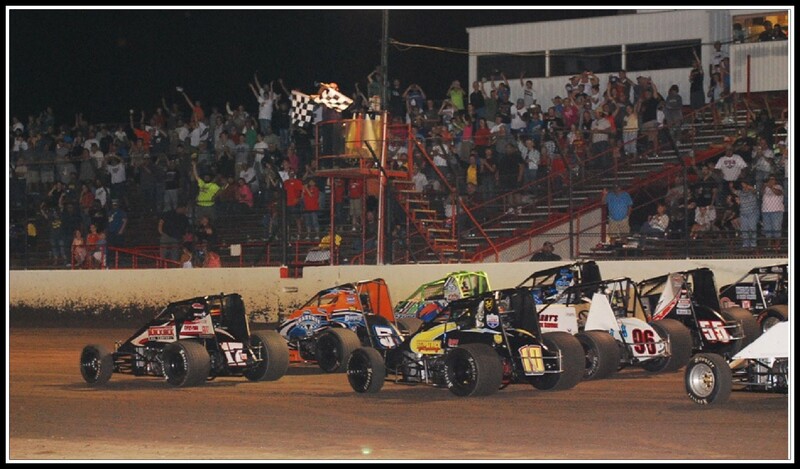 Racing enthusiasts can enjoy sprint car racing including the World Of Outlaws and open-wheeled modifieds from April through September. 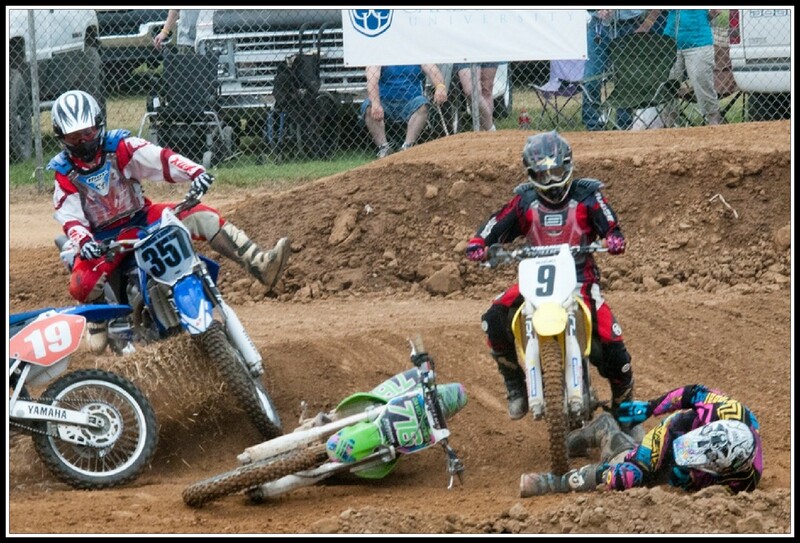 Races are held every Sunday night with special events included throughout the season. Located on US Hwy 41 near Haubstadt, IN. When people gather, the Gibson County Fairgrounds is the perfect location! 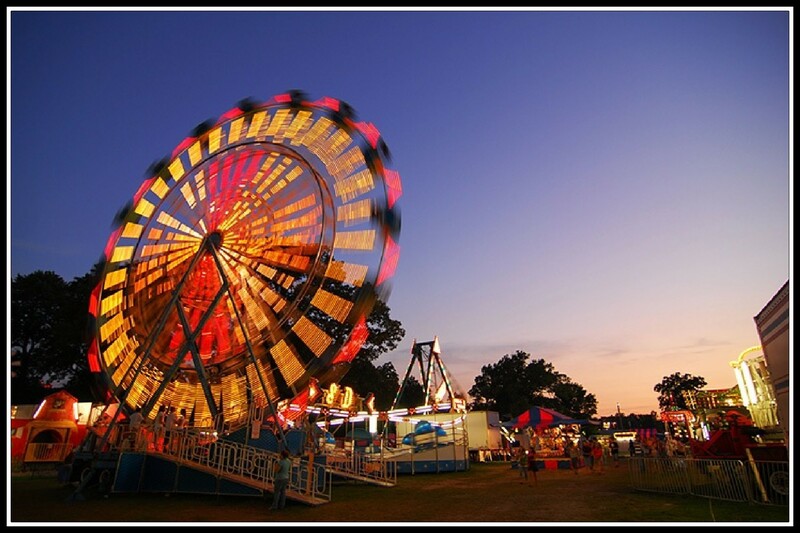 Every July, it is home to the Gibson County Fair, Indiana’s oldest continuously running county fair, started in 1852, the same year as the Indiana State Fair. During the American Civil War, Camp Gibson was created to train soldiers for the Union cause on the grounds of what is now the Gibson County Fairgrounds. The 58th, 65th, and 80th Indiana Infantry regiments were all organized at Camp Gibson. Today, the fairgrounds provides ideal facilities for company picnics, corporate meetings, group gatherings, weddings, receptions, reunions, graduation parties, social events, Christmas and holiday parties, trade shows, consumer shows, church events, auctions, flea markets, gun shows, car shows, tractor or truck pulls, concerts, horse shows and rodeos, livestock and other animal events. 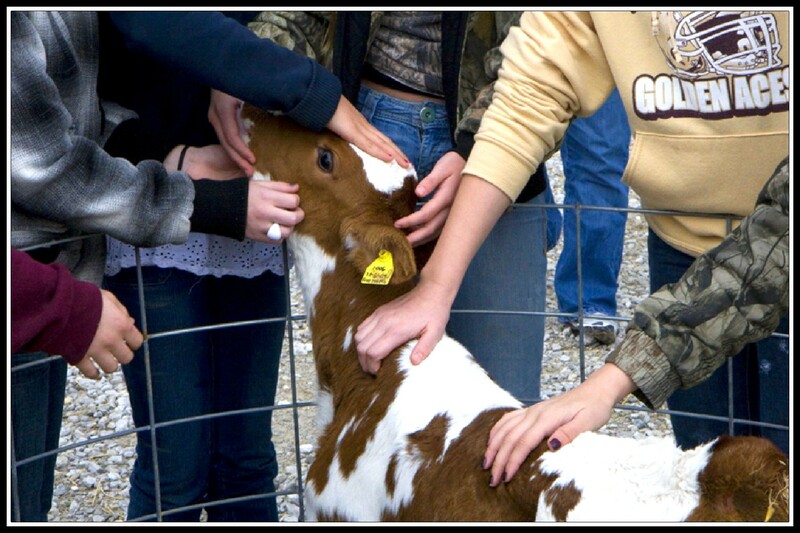 Facilities include the 4-H Exhibit Hall with seating capacity for 350 people, the Activities Building with seating capacity for 275 people, and the Pavilion, a 32,500 square foot multi-use indoor arena or exhibit space perfect for livestock and horse shows, rodeos, undercover car rallies, garden and antique tractor pulls and any other events where protection from weather is desirable. A large midway, a grandstand and arena area with seating capacity for 2,700 people, plus three 4,000 square feet merchants buildings round out the facilities. James Cockrum a resident of Oakland City, was born in 1799 in North Carolina and purchased land in Gibson County in 1818. 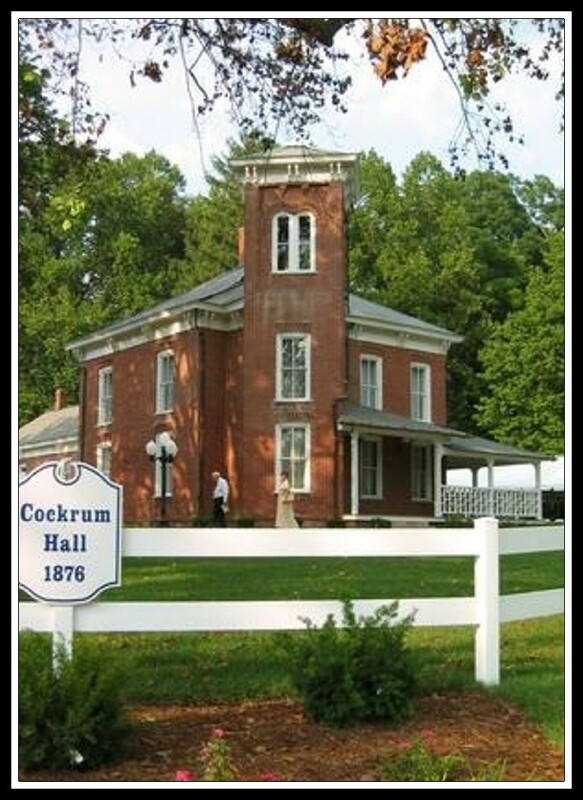 Along with sympathizers in Warrick, Gibson and Pike Counties, Cockrum and his son, William Monroe Cockrum, used their barn to aid enslaved Blacks seeking freedom along the Underground Railroad. Cockrum died November 19, 1875. His home, located on the Oakland City University campus, was placed on the National Register of Historic Places in 1978. With restoration completed in 2002, Cockrum Hall houses the Offices of Development and Alumni Affairs for Oakland City University. 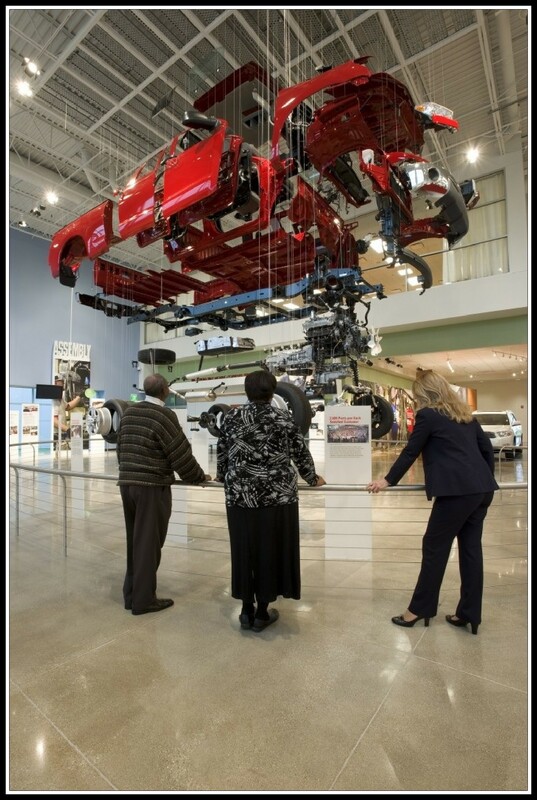 Get under the hood at the Toyota Indiana Visitors Center! Explore the history of Toyota from its early role in the textile industry to its position today as a standard bearer in automotive production and quality. View a demonstration of an original Toyoda Type G Automatic Loom and learn the poignant story of how this loom is now producing backing for quilts donated to wounded American troops. Watch the sparks fly as you take a free tram tour through the Toyota manufacturing facility and observe the Toyota Production System up close.